“My Beloved Gelatino” — coming soon to the CW. Now, what exactly a “+3” cube would be, I’m not sure, because the last time I played D&D, back in Ye Olden Tymes, a “+(x)” designation was more for weapons and items, not for living creatures. 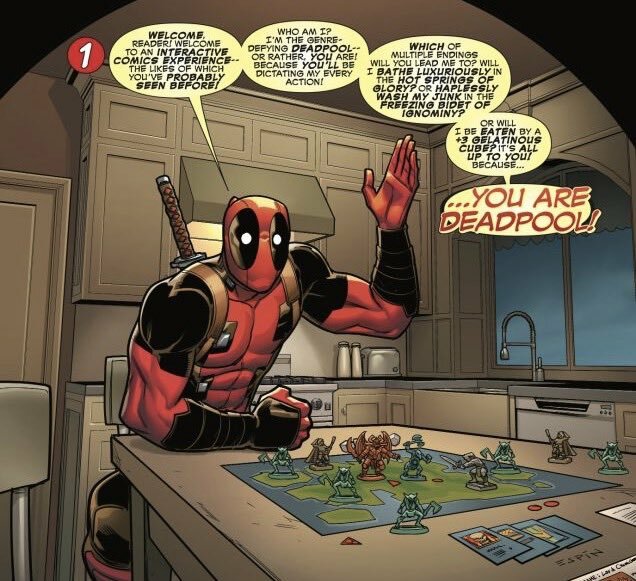 Perhaps Deadpool is being, as shocking as it may seem, less then accurate about D&D terms for humorous effect. HOW DARE HE JOKE ABOUT MY BELOVED GELATINO–er, anyway. Thanks to Bully for keeping the Cube faith alive…and allowing me to resurrection this much-neglected category on my site! Getting an early start on tomorrow’s EoC post, so today’s post is a bit short. So Greg, on the Twitter, pointed me in the direction of a couple of message board threads in which the Gelatinous Cube is discussed: first, it is wondered what a dead Cube would look like, and lo, it is revealed. 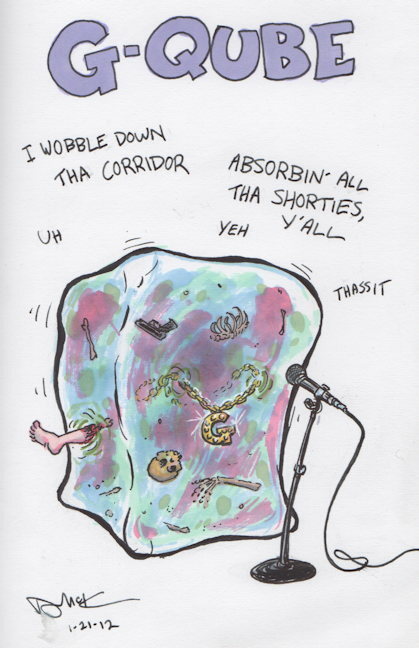 Secondly, in another thread, the supposed origin of the Gelatinous Cube is dished out. Bully, the Little Stuffed Bull, and his pal, Shelly the Little Otter Puppet, try out their new ping pong kit with adorably animated results. …Okay, not strictly speaking “comics,” but it’s awesome and you should go look anyway. This week’s entry in pal Andrew’s ongoing Nobody’s Favorites is sure to honk off some of you. And I don’t use the phrase “honk off” lightly. Also not comics, but pal Dorian is going to be doing in-depth looks at the work of novelist John Connolly every Monday, so if you like those mystery-type books, go check it out. Once I have finished converting Progressive Ruin to a Gelatinous Cube fan-site, my job on your planet will be done and I can — at long last — return to my people. MY FIRST GELATINOUS CUBE POST FOR 2012. § January 19th, 2012 § Filed under gelatinous cube, pal plugging, sir-links-a-lot Comments Off on MY FIRST GELATINOUS CUBE POST FOR 2012. Oh, you poor, misguided warrior. 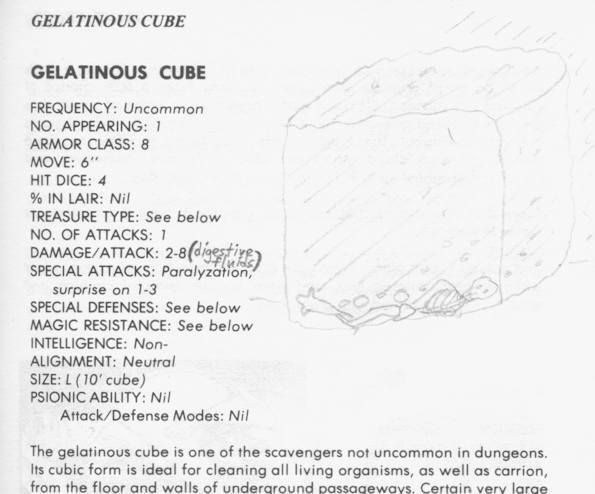 There is no defeating…the Gelatinous Cube. Speaking of Bully, I helped him out a bit with his “366 Days of Alfred Pennyworth” project. Not comics, but pal Dawn has written a book ( FaeMaker: Making Fantasy Characters with Polymer Clay ) and I thought I’d point that out to you folks. You might have seen her selling her wares at a San Diego Con or two, and she’s a swell gal…so please pick up her book if that sounds like something you’d be into! Pal Dave whips out a long-awaited new installment of “This Used to Be The Future” with…The Secret Story of Ray-Gun 64! Decided I needed to beef up the “Gelatinous Cube” category a bit. 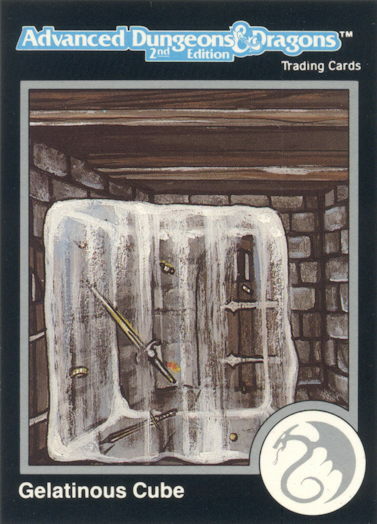 …and paste it into that big ol’ blank space next to the Gelatinous Cube entry in your first edition Monster Manual (provided you haven’t already supplied an illustration of your own), and you’re all set. 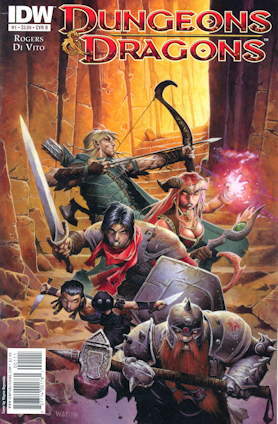 Yes, yes, I know that means crossing the 1st Edition/2nd Edition AD&D streams. Don’t you rules-lawyer me. Also appreciated: the clarification that the 2-8 hit point damage it can inflict is caused by “digestive fluids” and not by, say, the Cube hitting you with a polearm. …yeah. 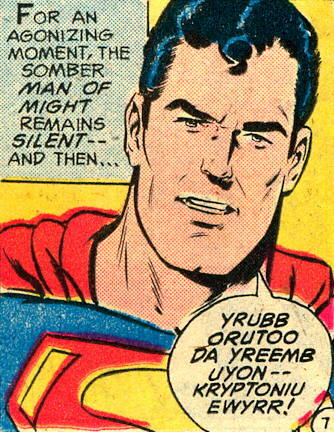 I suppose, once I have a spare decade and a complete collection of Superman comics, I can catalog the different ways Kryptonian has been represented over the years. Then I can finally fulfill my dream of opening a Kryptonian language camp for underprivileged children, and we can compete with the Klingon language camp across the lake…but perhaps I’ve said too much. Kevin Church wrap ups one webcomic, immediately starts up another: The Line , with art by Paul Salvi. Forgot to mention that Awesome Hospital artist Matt Digges is also writing the current storyline: starts here, with awesome installments to follow! Pals Dorian and Ken unleash their latest movie trailer reviews over at the Bureau Chiefs site. The trailer reviews really are among my favorite things. So The Variants , the critically-acclaimed comedy web show what takes place in a funnybook store, is gearing up for a second season, and here’s the shocking teaser. Rick Veitch draws the Gelatinous Cube from Dungeons & Dragons. Here’s an interesting look back at Comico’s licensing of properties for comics, including Macross and Jonny Quest . Of particular note is the mention of one cult-favorite ’80s character that Comico licensed but ended up not publishing. I hadn’t known about that! Dr. K discusses the possible influences on Will Eisner’s adoption of the term “graphic novel.” Bonus: comment section includes some respectful and informative additions from cartoonist Eddie Campbell. Nerds Ruin Presidents. Warning: CANNOT BE UNSEEN. I’m a difficult person to work with. "’Save versus girls?’ Man, I always make that roll." …which by itself is pretty typical, but has an opening minimum bid of $648,000. 1) Typo – opening bid was meant to be $6.48, and mistakes were made. 2) Prank – seller just thought it would be funny to list this for $648,000. 3) (The most likely reason) Attention-grabbing advertising – potential bidders see that minimum bid in the listings, checks out the auction to see what the heck’s going on (and thus are exposed to a blurb for the seller’s eBay store). 4. Done in the hopes that he’ll actually realize that price – hey, just gotta sell one. The shipping is a fairly reasonable $4.25, however. I don’t know why, but I was on some Gelatinous Cube trip at the shop the other day…a strange throwback to the days when I actually sold the D&D stuff at the shop. 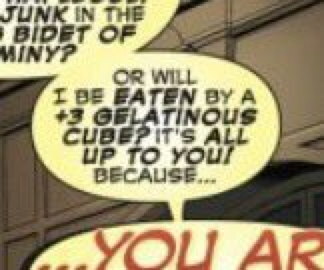 I was wondering two things: 1) if a player character was polymorphed into a Gelatinous Cube, if he or she could continue playing as a Cube; and 2) has anyone made any kind of D&D-themed snack food designed around the Gelatinous Cube? You know, little squares of clear Jello with some of those candy skeletons, the kind that are always being sold around Halloween, embedded inside. Chris says the answer to #1 is “yes,” though it probably depends on the DM. The answer to #2 is, um, I don’t know, as my Google-fu has failed me. Maybe one of you out there can clue me in. 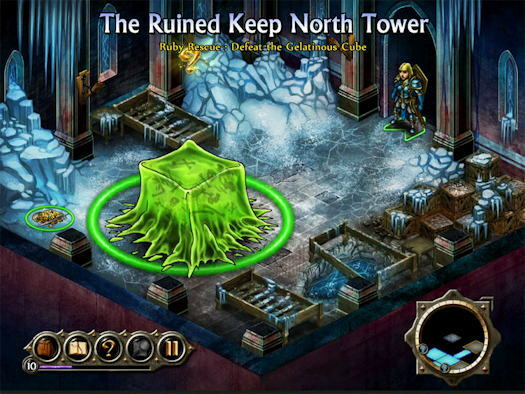 The cube as it appears in Neverwinter Nights. Here’s a miniature for sale, a homemade mini in progress, and another nice mini. A Worth1000 Photoshop contest entry along the lines of my Jello snack idea. EDIT: I’ve been informed that, by some odd coincidence, John Kovalic ran an Unspeakable Oaf panel today that involves a Gelatinous Cube. Yeah, I know, Gelatinous Cube talk doesn’t really fit the usual comics theme here, but I had to get it out of my system. If you’re not satisfied with the quality of Progressive Ruin, please write for a refund. “In some comics, the violence and blatant sexual advances rival that of infamous video games like Grand Theft Auto and the Resident Evil series. Some persue practices or customs that are tied to the occult, whereas others dabble in matters of society, like homosexuality, and drug abuse. “The real question is, who do you want teaching your kids about those things, you or the comic book? Poor spelling still okay, though.